I adapted this recipe from meatoutmondays.org. 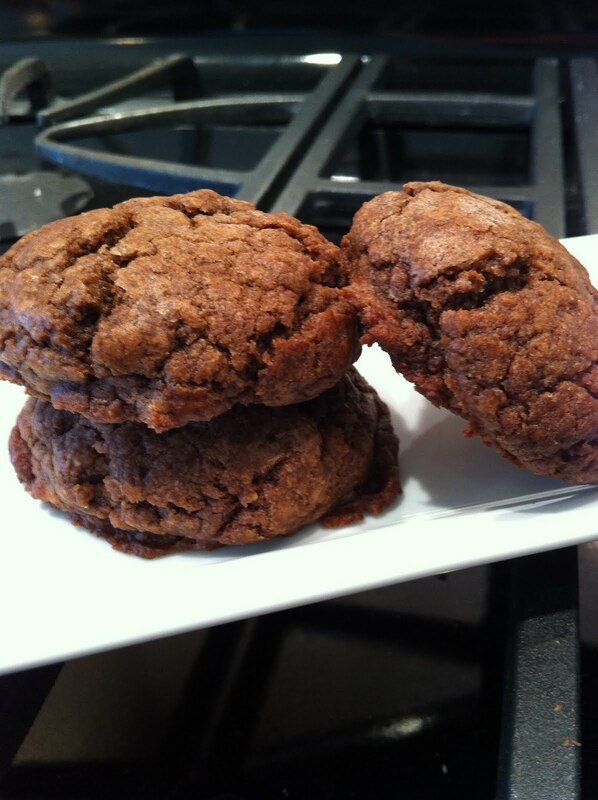 I melted the chocolate chips into the batter by mistake the first time I made them and now that is how I make these simple but decadent chocolate cookies! Preheat oven to 375 and line 2 baking sheets with parchment paper. This recipe makes about 2 dozen cookies. In a medium pot, combine oil, bananas, sugar, and salt. Warm over low heat for 2 minutes, whisking to combine. Using a spatula, stir in the chocolate chips and let them melt. This will take about a minute. When combined, turn the heat off. In a bowl, combine the flour and baking soda. Add the chocolate mixture and mix until the flour is incorporated and you have a great chocolate ball of dough. Using a three tablespoon ice cream scooper, scoop out the dough onto the parchment paper. Bake for 13 minutes and then let cool. Enjoy! wow this recipe is awesome. i am going to try it out today. I have ripe banana's at home and was wondering what to do with them. Thanks a lot for the recipe. You have a wonderful space.